Cajeta (pronounced cah-heh-tah) is a silky smooth Mexican caramel similar to dulce de leche. The one big difference, and the thing that sets cajeta apart from regular caramel and dulce de leche is the type of milk used. Most traditional caramels use cow’s milk, while cajeta is made from goat’s milk, or even from half goat’s milk and half cow’s milk. The milk is cooked for a relatively long time over a moderate heat, with a constant stirring, allowing the milk to thicken as the water evaporates while it cooks. The milk is sweetened with sugar and flavored with spices like cinnamon. Some variations use vanilla as a flavoring agent, while some use sherry, a Spanish fortified wine. Intrigued with the idea of using a sherry in our recipe, we folded in some cream sherry that added a nice sweetness to the cajeta and another layer of flavoring we had not tasted before. Start with some goat’s milk in a large heavy pot. The mixture will expand a bit and may bubble over in a smaller pot, so give it room to grow and use a large pot. Keep in mind that the amount of surface area your milk has to cook in will directly affect the cooking time. For the first leg of cooking you only have to stir the pot frequently, about once every couple of minutes. The light corn syrup will help to stabilize your sugar, preventing it from forming little crystals, although some cajeta candy is made with a soft crumbly texture, notably El Salvadorian milk candy. 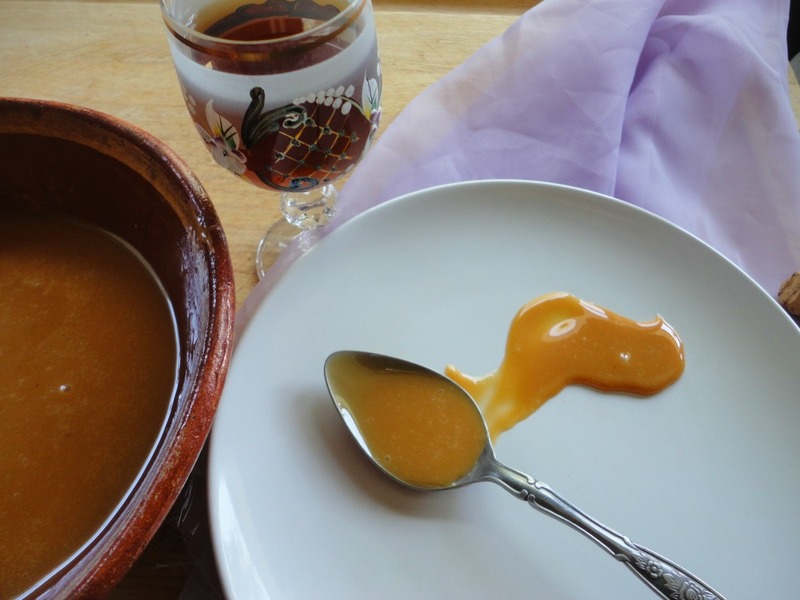 The uses of cajeta are similar to those of caramel. Cajeta is great drizzled on ice cream, cookies, and lightly sweetened breads. One of the most common ways to eat cajeta is with a spoon straight out of the jar, like peanut butter and hazelnut spreads. For a quick breakfast or a sweet snack, the cajeta can be spread on dry toast and served with tea. In a large heavy pot, mix together the milk, sugar, corn syrup, and cinnamon stick. Bring to a boil over medium-high heat, it takes about 5 minutes. Turn off heat. Dissolve the baking powder and water. Add the baking powder solution to the pot of milk. Stir to combine. Making sure the mixture does not over flow. Turn heat back to medium, cook for 30-35 minutes, stirring occasionally. The mixture should start getting thicker and more golden in color. Now stir the mixture almost constantly and cook further for about 8-10 minutes or until the mixture is thick like a maple syrup. It will be very hot so be careful. Before it cools too much, strain through a sieve and discard the solids. Carefully mix in the sherry until very well incorporated. Huge caramel lover here and I’d love to try cajeta! I really like the idea of the sherry flavor in your version. Great post! Hi Bill, send us a pic if you make your own batch! Glad you enjoyed the post.